A guide for coaches and consultants to improve your client discovery process, develop more effective client-centric solutions, and be the leader that your clients need. 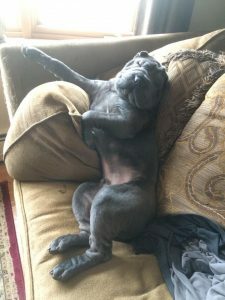 Nearly six years ago I fulfilled a lifelong dream and become a proud Pei-parent to a cute, energetic, sassy little pup named Titus. Leading up to, and while becoming a pet-parent, I read all that I could about training dogs, and I took Titus to puppy school to learn manners to become the best dog that he could be. I learned that when dogs are shy or skittish about doing certain things they might be afraid of or don’t like, such as bath time or trimming of nails, that I should give him a premiere treat to help him associate what could be a not-so-pleasant experience, with something that made him really happy, like a treat, so that he’d be more accepting and willing to participate in that activity, without fear. Over the years, I tried a number of treats, continually upgrading from run of the mill dog treats, to premium dog treats, to homemade cooked meats. My greatest weapon? Cheese. Bath time, Titus would hide under the furniture. Time to trim his nails, he’d growl and wouldn’t let me get close to his feet. This called for cheese. I pulled out the cheese in the most challenging of times to be able to convince Titus that we were going to have a pleasant experience and that he would be rewarded for allowing me to give him a bath or for trimming his nails. 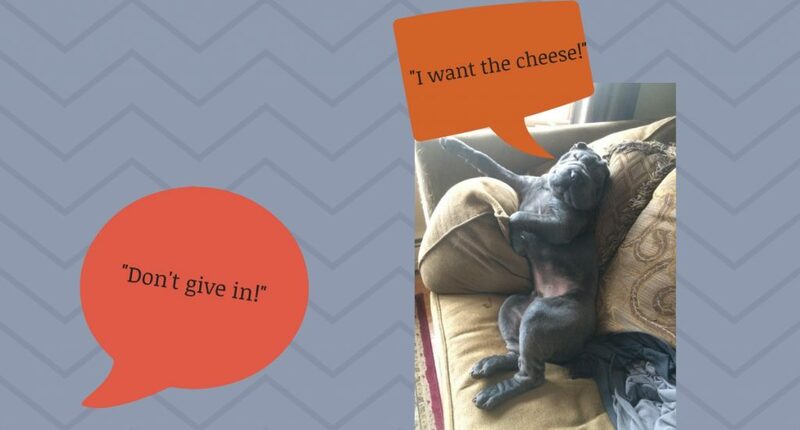 Over time, Titus became spoiled and began dictating to me when he got cheese. Don’t want to wake up in the morning to go potty? Ok, I’ll bribe you with cheese. Don’t want to come when your name is called? Cheese. Won’t eat your food? Let me pile it up with cheese. Cheese, cheese, cheese, cheese, cheese. Talk about the tail wagging the dog, I was in the throes of control by my cute, spoiled, cheese-consuming, dog. On top of all this, I noticed that Titus would throw up on occasion. I started paying attention, and I could see a correlation to days when he’d get sick, to days when I had fed more cheese (or yogurt). I began reading more about dairy for dogs and learned that it isn’t good for them. It’s ok for some dogs to have cheese or yogurt as treats, but more and more articles expressed the view that dairy should not be a treat of choice, or given very rarely. Even after learning this, I had a very difficult time weaning him from the cheese so I continued giving it more often than I wanted to. It was my fault. I was giving in to what Titus demanded, ultimately to make my life easier, even though it wasn’t good for him, and I was keeping him sick. I was failing him. It recently occurred to me that I’ve had a few client relationships like this. Someone who sought me out to provide brand strategy consultation, I would provide them consultative advice based on goals they had laid out, but they wouldn’t follow that strategy. Instead, they’d tell me what they wanted to do, and dictate what services they wanted to hire my team for. Just like Titus, they’d demand cheese even though the cheese was all wrong. And there was once a time, where I would have given in and given them the dang cheese. Does this sound familiar? Do you have spoiled or stubborn clients who are used to getting what THEY want, even if it’s not good for them? As a provider of a service, you have a choice about whether you are going to give in to what your customers demand, or if you are going to be the expert they truly need, and help them see the best solution. You are not doing your customers, or yourself any good if you give in to their requests, if you know that it’s not the right product or solution. You might sit down with clients who will tell you that they know what you should be charging, what your competitors do, what they charge, and what product or service they want to buy from you. Customer’s today are highly educated and they might think they know exactly what they want and what they need. This can create a situation where a client feels that they have they really know what they need. However, they don’t know what they don’t know, and while they may have done a lot of online research they are still coming to you for a reason (you are the expert). This creates a conundrum: people think they know that they need the cheese. Therefore, you as the service provider feel the need to sell them the cheese. You let them lead the sales conversation which they and you both know will end with, cheese. The problem with this, is that it devalues what you could be providing your customer and belittles your relationship from consultative to, transactional. If you want to sell your skills, product or services based on value, then you don’t want to get into an undercutting and undervaluing pricing game. More importantly, to give in to what a customer wants, that likely won’t get them results, feels icky. The cheese will make them sick, and you’ll be held accountable when it’s all said and done. So, what’s the solution? Take your clients on a journey that allows them to see you as the expert. Your job is to help your clients see where they are now and understand what they need in order to accomplish their goals. The process is not about you and your products, it’s about understanding your customer and their needs, and then providing solutions to those needs. This is called filling the value gap, or providing value to your customers. The value comes in helping them realize and achieve their ultimate goals and dreams, and then you being the provider who takes them on that journey of realizing it. The key to helping your client see the value you provide is by finding a way to open up the conversation so that it allows them to see where they are now, and where they want to be; it might be much bigger/wider/different than what they initially thought. They may have called you and said, “I just need my oil changed,” when really they need a new engine entirely. Or, “I want to run radio ads,” when really, they need a new website that actually converts visitors to leads. They might have asked for the cheese, but if you know cheese is not the solution, you have to help them see this, because after all, you are the expert. You can do this by asking the right questions. Before you ask the right questions, remind the prospective customer why they sought you out, and let them know that you are going to ask a lot of questions so that you can best advise them. Get their permission to proceed. You want their buy-in at every step of the way. Remove resistance throughout the process. What’s your long-term company vision? What are you known for in the market? What do you want to be known for, and why? What are your profit margins on each item/product/service? Where is the most market opportunity now and in the coming months? How do you currently capture leads? How many leads do you need per conversion? What would it take to close more of the leads that you’re already getting? How do you want to make customers feel? How do you make them feel now? What’s your average lifetime value of a customer? What’s your average cost per conversion/sale? What’s your goal cost per conversion/sale? You must know the full picture of what’s going on with your client and you can get to it by asking the right questions that allows you to see the whole picture. By asking the right questions, you will likely find that it’s rare that a client actually has solid answers for all of the questions, and this helps them realize where their stumbling blocks might be and the work that needs to be done before prescribing a solution. Your goal should be to help your customer understand what’s going on; because while it might be apparent to you, it’s likely not apparent to them (that’s why they called you). You do this by taking them on that journey to see where they are, see where they want to go, and help them understand how far they do (or don’t) have to go. They might be thinking the solution is cheese, and by exploring where they actually are, and where they actually want to be, they will start to realize that cheese is NOT the solution; your goal should be to help them see that for themselves. Finally, you’ll want to help your customer understand the cost of inaction, or the cost of eating the cheese, even if they know it’s not the right choice. It is their choice to make, and you can help them understand that you will not be the one to guide them down the wrong path. We all get to choose how we conduct our businesses. I have realized the ramifications of giving in and giving the cheese even when I know it will make Titus sick; it’s a bad feeling of guilt and shame. It’s the same with clients. You are doing yourself and your client an injustice if you knowingly sell them the wrong solution and they will likely hold you accountable down the road when they don’t get their desired results. If you have spoiled clients, it’s never too late to do the right thing. Will it be difficult: likely, yes. But will it be in the best interest of you and your client? Yes, it will be. Might you lose clients? Yes. But isn’t that better than keeping them sick? If you’re a coach seeking to build confidence and create structure in your business, you might benefit from working together in a coaching program I offer for heart-centered entrepreneurs who are building profitable and purpose-drivens brands. You can book a call with me here. If you are a company seeking to develop a solid brand strategy, connect with my agency team at Strategic Partners Marketing, here. I’m willing to bet that un-training your spoiled clients might actually be easier than un-training my spoiled Pup. Unless your clients are as cute as this.